It seems inevitable that music would eventually find its way back to electronic pop. Electronic music was the vehicle from which some of the best pop music ever written came forth. Yes, I’m talking about the 80s, which in this writer’s humble opinion, was the golden age of pop music. But it was never fully explored. It’s time was cut short by the hair metal of the 80s where artists forsook electronic experimentation for big stars and guitar solos. Electronic pop was thrown to the wayside for the exciting new sound. That is, until recently. You could say it was Radiohead, you could say it was LCD Soundsystem, you could even say it was Kanye West but whoever started it, the most exciting music being made these days is in electronic pop. Bands like Hot Chip and MGMT are two examples of rising stars in this new/old genre and both of them made some of my favorite albums last year. 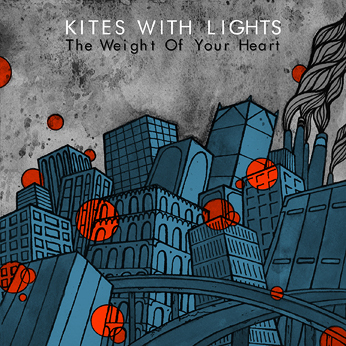 Now comes Kites With Lights, a new band from Florida that seems to continue this trend. Their new EP, titled, The Weight of Your Heart, begins with the sound of a subway train on the title track. It seems to immediately evoke a distance between the singer and his subject, as if the singer was on the train, traveling away from the lover who broke his heart. When he sings, he is singing from both a physical distance between his lover and him but it’s also an emotional distance as well. This is no more clear than when singer Jonah Cordy sings later in the song, And you can say what you want/because we’ve waited too long. These words seem to echo this theme of distance as if the singer is telling someone that nothing they say could hurt or do damage to him because the damage has already been done. This theme continues throughout the EP, as Jonah Cordy (who’s the only member of the band) explores the distance he finds between himself and love interests, the world, the unknowable, etc. He does this throughout the EP with synthesizers, guitar, and his voice. All of it is danceable which is why electronic music goes so well with pop music. The synthesizers are always bright and seem to pop through the rest of the instrumentation and really drive all of the songs. The closing song, The Sound of Rain, is the best song of this EP, with driving synthesizers and string sections which nicely flow with the rest of the instrumentation. He sings, Every sound that’s in your heart/is waiting to get out/every silence that is sad/is a dream you’ve never had. This is also the song which shows the most promise for the band. The other songs, while solid entries, never seem to break free of what’s gone before them. The Sound of the Rain takes what was best of the electronic music of the 80s and adds in what makes the new trend of electronic pop exciting to listen to today. Overall, Kites With Lights is a band that should stay on your radar because their best music is ahead of them, which is always exciting to see.